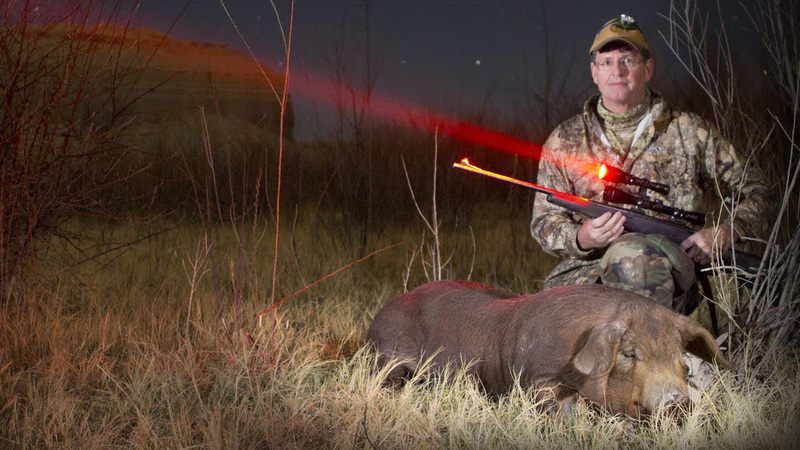 Using the best hunting lights can make your life easier when you’re hunting varmint. Unlike classical models, predator hunting lights are specially designed to be impossible to spot by coyotes, hogs, or foxes, so using them will provide a clear field of view on your target without it noticing you. This will allow you to get rid of the varmint that stalks your lands in quick succession. 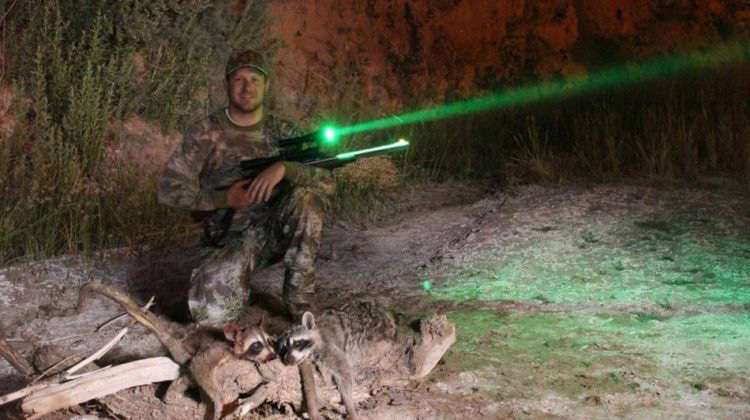 We’re certain that after reading the coyote hunting lights reviews we prepared in the following article, you will be able to determine which model is better suited to your needs. Without further ado, let’s take a look at the top 10 varmint hunting lights of 2019, and how to find the right model. We start off this list by presenting a budget solution for your hunting passion. The SHIGLOO predator hunting light has an intensity of 350 Lumens, and it’s bright red, making it easily detectable by you, but almost invisible to the predators. One of the things we enjoyed about this model is that it has a durable construction. The flashlight is made out of a strong aluminum allow, and it comes with a good mount. This model comes with a rechargeable battery, so it’s fairly easy to use. The flashlight’s light bulb has a lifespan of up to 100,000 hours, so you can be certain it will last for a very long time. The WindFire green LED tactical flashlight is an inexpensive model that’s specially designed to be effective for predator shooting. 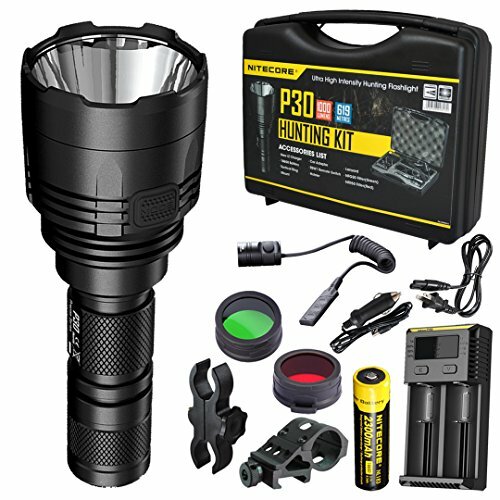 This model comes with everything you need to set it up, and it produces 350 lumens of green light to highlight your targets when you’re hunting at night. One of the things we appreciated about this model is that it comes with a long-lasting battery. This unit uses a rechargeable 3.7V battery, and a battery charger is included in the package. The battery can last for several hours of continuous use, and it will fully recharge in up to 7 hours. Good Illumination – The green light will provide a good illumination without being noticeable to the animals in your area. 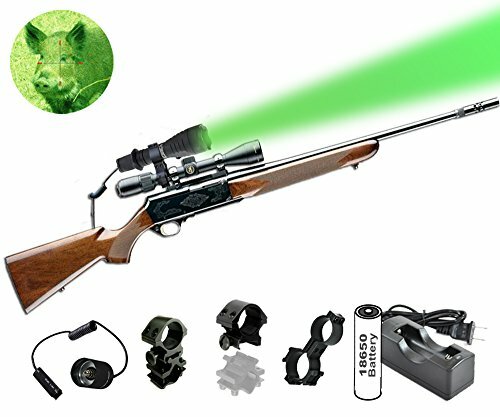 The ORION H30 predator green light is a great model for those who enjoy long-distance shooting. This unit can produce a powerful light beam and it will highlight targets within a 273 yards range. We were impressed by the flashlight’s illumination and its runtime. This model produces a powerful light, so it’s suitable for those who enjoy hunting using a scope. And as far as the unit’s runtime is concerned, this unit can run for up to 4 hours continuously at its maximum setting, and for up to 120 hours at its lowest. Another great thing about this model is that it comes with a 10-year warranty service. This is a clear sign of the manufacturer’s confidence in the model. Pricey – Even though this is a great tactical flashlight for night hunting, it comes at a steep price. The Z-Z predator hunting light is another cheap model that’s good enough to make it on our list. This unit produces an intense light, and it has an output of 250 lumens. 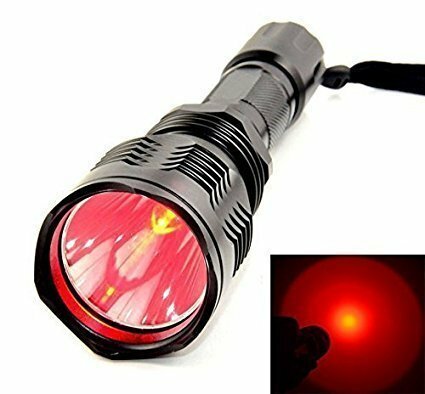 The red light is bright enough to be easily detectable, and it will illuminate anything within 100 yards, with noticeable eye reflections at up to 250 yards or more. One of the things we liked about this model is that it has an ergonomic grip. 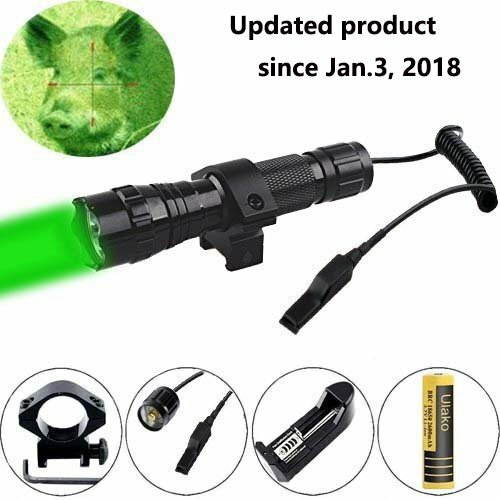 Not only will this make the flashlight easy to handle if you decide to use it as a tactical flashlight, but it will also make the unit rather easy to mount. Good Price – This model comes at a good price, and it will illuminate your targets nicely. Large – This flashlight is rather large, so you won’t be able to use it as a pistol light for compact and subcompact models. The Nitecore P30 is a complete kit specially designed for those who enjoy night predator hunting. This model comes with everything you need for the occasion, from the flashlight to a battery charger, and even a convenient carry case. We liked that this model comes with a versatile hunting light. 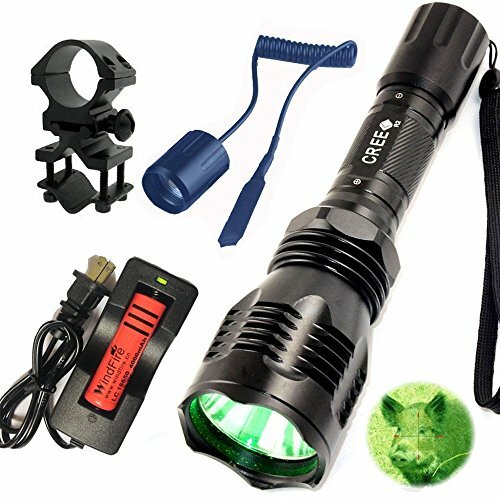 The flashlight comes with both a red and a green filter for different illumination outputs, so you can use the one that fits you best. The flashlight is also easy to use. The on/off button and the ones that change the light’s intensity are placed within easy reach, and you can control them with your fingers even when the unit is mounted on a rifle. Very Powerful Illumination – This model is suitable for long-distance hunters because it can illuminate targets located at up to 676 yards. Color Lenses Diminish Light – Both the red and the green color lenses diminish the light significantly. The Ulako red predator light has a simple yet effective design. This unit comes with all the accessories you need to install and use it, and it produces a good illumination that will highlight your targets if they’re within a 250-yard radius. One of the things we liked about this model is that it has a well-thought design. The flashlight itself is not very large, and you can fit it into one of your tactical vests’ pockets if you don’t want to mount it on your rifle. The unit’s battery runtime is of 4 – 5 hours when it’s fully charged, and a recharge cycle will take up to 5 hours. The flashlight has a waterproof design, so you can use it with great results in every kind of weather conditions. The VASTFIRE green predator light is a popular model among night hunters. Unlike the models we reviewed so far, this one comes with a zoomable green light and it’s specially designed to mount on a Picatinny rail, so it will be very easy to install. We were impressed by the flashlight zooming capacity. When it’s not zoomed in, the flashlight produces a broad and unfocused light that will illuminate anything in its range. When you zoom in, the light beam becomes narrower and more focused, making it easier to spot targets that are located farther away. Poor Quality Control – The manufacturer’s quality control should be better. Some customers complained that they received the kit without one part or another. 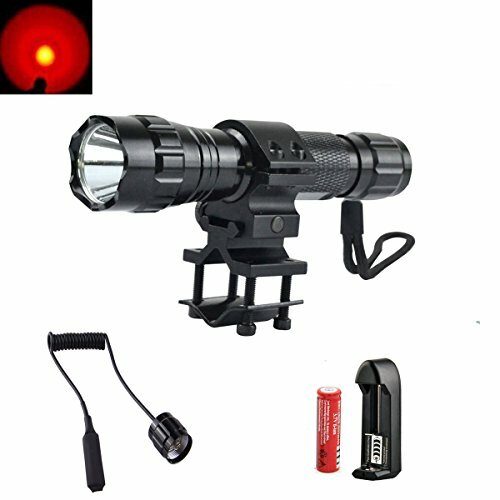 The Predator Tactics coyote hunting light is a complete kit specially designed for night hunters. This model is bright and easily visible, and it will highlight your targets from a long distance off. One of the things we loved about this model is that it illuminates anything within a very good range. You can clearly see your targets within 250 yards, and you will be able to see the target’s eye reflection from more than 450 yards. Another good thing about this model is that it has zooming abilities. 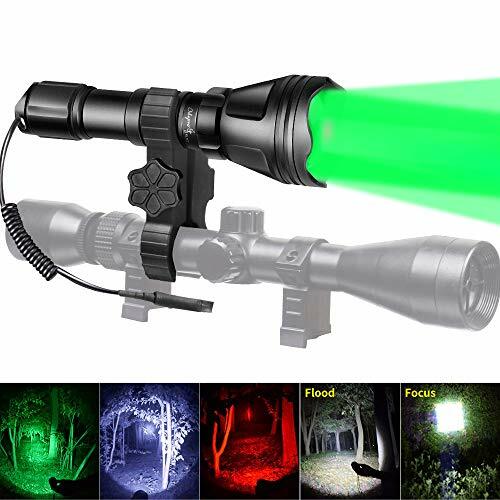 This will allow you to highlight your targets from a long distance off, and you will also be able to use the flashlight when hunting with a scope. Expensive – Despite the fact that this is a good model, it’s also an expensive one. The Ulako green light is a cheap yet effective solution for varmint hunters. Despite the fact that this model comes at a low price, it’s good enough to hold its own when you compare it with more expensive models. We really liked this model’s simple yet effective design. 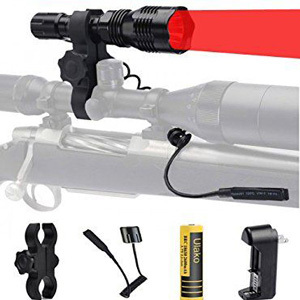 The flashlight comes with everything you need to use it, and it’s easy to mount on a shotgun or rifle. Moreover, the flashlight is waterproof, so you can use it in all types of weather conditions with good results. The flashlight can run for up to 4.5 hours continuously before you have to recharge its batteries. Long Recharge Times – The flashlight’s battery takes a long time to recharge, and a complete recharge cycle will last several hours. We finish this list by presenting a highly versatile model. 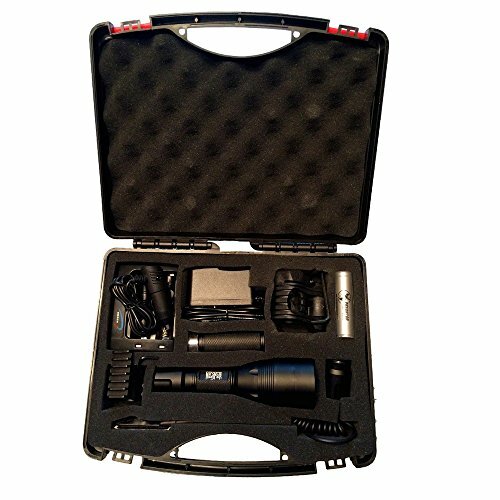 The Odepro predator hunting flashlight comes within a nice plastic carry case that includes all the accessories you need to use the flashlight and then some. This model has an adjustable focus, and it comes with 4 interchangeable LED modules. Each module will produce a different illumination. You can choose between a red, a white, a green, and an IR blue light to illuminate your targets. Durable – This unit is made out of shock-resistant aircraft aluminum, so you should expect to use it for a very long time. As you could see, there are a lot of flashlight models you can use for predator hunting. This makes it somewhat difficult to find the best of them, with most models being advertised as being better than its competitors. That’s why we decided to create this short buying guide. We’re confident that after reading the guide you’ll be able to choose the best hunting lights for your needs. Here’s what you should look for in a model. Light Color – The most important quality of a hunting flashlight is, of course, the light it produces. One of the mistakes rookie hunters make is using a bright white or yellow light when hunting coyotes. This will allow the coyotes to spot you before you spot them, so they will have an easy time avoiding you. If you want to hunt varmint, you should choose either a red or a green light. Despite the fact that these species see well in the dark, they cannot see the red or green specters, so they will not notice you. This will make stalking coyotes easy, and it will allow you to get in range to make an accurate shot. Keeping the light above the coyote’s eye level might also help, as some of them can be light-shy. Light Zoom – Some predator hunting lights have zooming abilities. Well, light zooming is more of a marketing term than an actual thing, but the feature is useful, nonetheless. The flashlights usually produce a broad light beam. This light beam will cover a wide surface, but it will not illuminate very far. Now, the flashlight models that use the light zoom feature are capable of focusing their light beams. Instead of illuminating a wide radius, the flashlight will now produce a narrow light beam, but it the beam will illuminate objects that are farther away. Light zoom is a very useful feature for the shooters who enjoy using scopes or red dot sights. 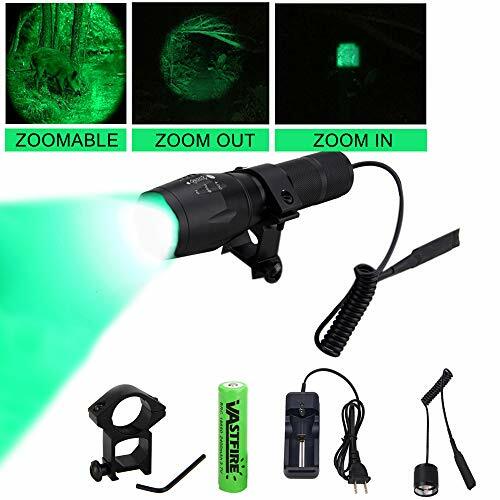 Thanks to the light zoom, you will be able to illuminate your target clearly from a long way off, so you will be able to make a clear long-distance shot even at night. Ease Of Use – You would think that a flashlight cannot be hard to use, right? Well, when you have to mount the flashlight on a shotgun or rifle and use it at night to hunt for predators, it might be. Some of the best varmint hunting flashlights have simple designs. Thanks to their designs, you can operate them using only a single hand, and you can do it reliably when you’re in a hurry. These models are also easy to mount on a shotgun or rifle, so you can install them easily. On the other hand, there are some models that have overcomplicated designs. Instead of turning these flashlights on or off using a single hand, you need to use both of them. Not only is this inconvenient when handling a rifle, but it’s also time-consuming and it might even cost you your shooting opportunity. Portability – Although you could say that a hunting flashlight is pretty easy to transport, this might not be the case for all models. Some models come with interchangeable light filters that might come in handy when hunting, so a better portability will increase the chances of actually using them. Some models come with plastic carry cases, while others come with different mounting brackets for an increased portability. Durability – If you’re going to use the flashlight when you’re hunting, chances are it’s going to see its fair share of bumps and drops. Well, this is why you need to make sure that the flashlight you use is durable. A durable design will not only ensure you will be able to use the flashlight for a long time, but it will also increase the chances of it still working after you drop it or bump it against something, so it won’t leave you in the dark. Cost – Last but not least, we have to take the flashlight’s price into account. If you’ve been looking for predator hunting lights, you probably noticed that they come in wildly varied price ranges. As with every other product, a higher price usually means that the flashlight comes with more features and accessories, but that doesn’t mean that the pricier models will perform better than the cheaper ones. One of the best ways to determine how much you should spend on a varmint hunting light is to think about how often you’re going to use it. If you live on a ranch and varmint constantly appear and eat or disturb your livestock, you’re very likely to use the lights often so buying an expensive model makes sense. On the other hand, if you’re only going to use the light a couple of times a year when you go hunting with friends, you shouldn’t go for the most expensive models. As you could see in our predator hunting lights reviews, even if all the 10 models we included on our list do the same thing, they come at varied prices. And while the price can be an indicator of the features each model offers, it’s not a clear proof of which of them are the best hunting lights. You should take into consideration how often you’re going to hunt at night before deciding on a model. Moreover, you should also take into consideration the type of varmint you’re after. Sometimes, using coyote hunting lights alone is not enough. You might need to use baits or lures to get your targets to come to you and finish the job.